Ng Ah Sio Bak Kut Teh (黄亚细肉骨茶) is one of the most famous Bak Kut Teh store in Singapore. Bak Kut Teh literally translates to "meat bone tea". It is actually a soup dish that consist of meaty pork ribs cooked together for hours with garlic, herbs and spices. Ng Ah Sio serve Singapore styled Bak Kut Teh, which is a clear and peppery version of this pork rib soup. Ng Ah Sio used to be run in a very traditional manner. All my relatives from Hong Kong know this as the bak kut teh store that rejected the Chief Executive. Nowadays, Ng Ah Sio is run in a modern, corporate manner, with much longer operating hours, a whole host of newer staff. Thankfully, the food remains as good as ever. The soup base of Ng Ah Sio's Bak Kut Teh is peppery hot whilst the meat is fall-off-the-bone tender. 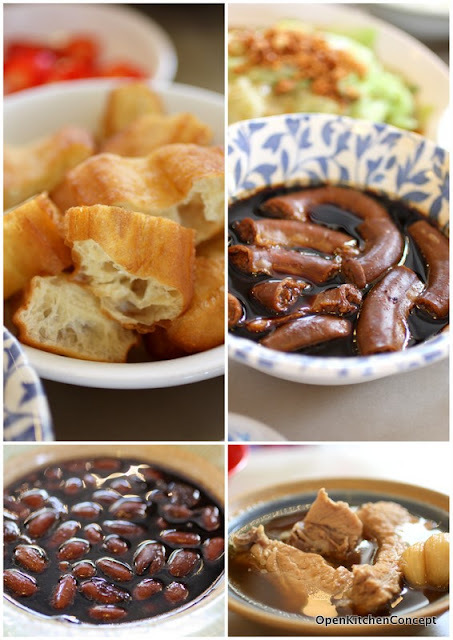 I think bak kut teh goes best with some fried dough fritters, which you can use to dip in the soup to soak up the dough fritters before popping into your mouth, where you get a burst of hot soup and then the flavour of the fried dough fritters. A true bak kut teh experience is never complete without the traditional chinese tea, which is what the "teh" (tea) in bak kut teh is all about. The slightly bitter Chinese tea cleanses your palate and washes down every thing just nicely. This is one of my favourite places to bring friends from overseas to.